Combine the flour, sugar, and salt for the pastry in a small bowl. Cut in the butter until the mixture is like sand. Don’t add any water. Squeeze into a ball of sorts, wrap, and refrigerate for 30 minutes to an hour. Prepare the steamer, and steam the green beans until crisp-tender. Salt lightly (1/4 t. or so), then set aside. In a small cast iron frying pan, melt the 2 T. of butter, and sauté the oyster mushrooms. Salt lightly and set aside. In a medium saucepan with a heavy bottom, melt the remaining butter and sauté the onion until translucent. Whisk in the flour to create a pale roux. Slowly add the milk in a steady stream, whisking as you go. Keep stirring as you drop in the pepper, bay leaf, and some grated nutmeg. Keep the sauce over medium-high heat as you constantly stir. Stir until the sauce boils, allow to boil for one minute, then remove from heat and add ¼ t. salt. Set aside in a warm place while you prepare the pastry shell. Preheat the oven to 450F. Butter a 9” pie pan, and remove the pastry from the fridge. You won’t roll this crust out. Just dump it into the pie pan, and press it using your fingers until you have a uniform thickness, and the crust reaches up the side of the pan. Pre-bake the crust for about 15 minutes, or until the edges are golden. Remove the crust from the oven, and turn the oven down to 350F. Fill the crust with a layer of steamed green beans, some oyster mushrooms, some more beans, and some more mushrooms. Pour the béchamel sauce over slowly, using a rubber spatula to distribute it evenly and thoroughly, without actively mixing the vegetables around. Sprinkle the fontina over top of it all, and bake until bubbly, about 35-45 minutes. While the pie bakes, slice some ripe heirloom tomato and prepare bacon bits for topping. NOTE: I originally set out to create a vegetarian dish, here. But, the sweet man who lets me feed him things even when he’s not excited about them is the one who suggested the bacon. As we both thoroughly enjoyed the pie (he even went back for seconds! 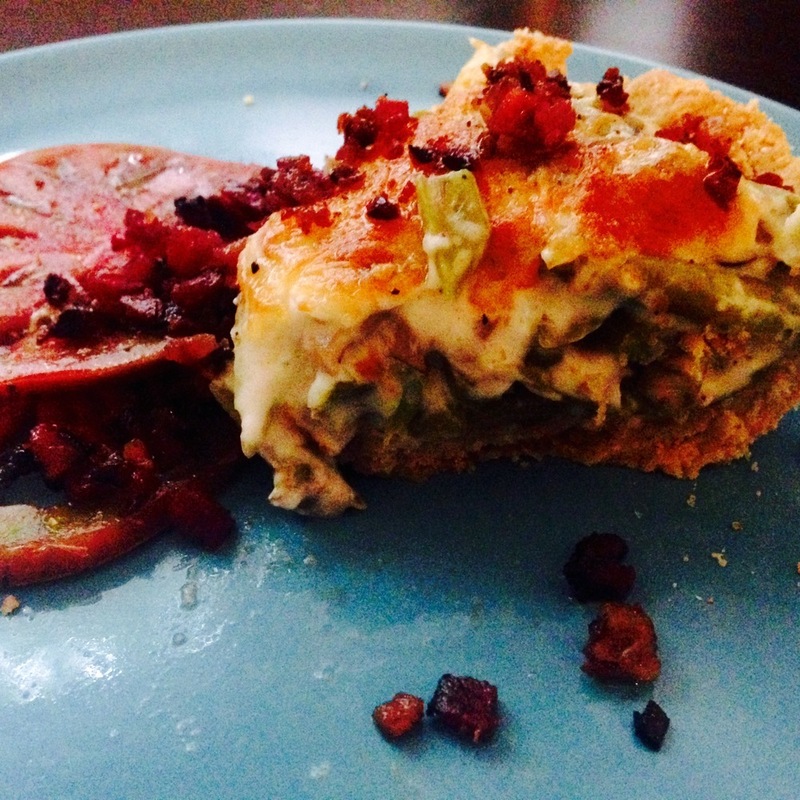 I did too…), we agreed they would be better inside the pie, incorporated with the veggies.